I sort of tripped and fell and discovered Patti Smith accidentally at one point- I'm not sure exactly when, but I know the song that did it: Because The Night. The Natalie Merchant version spent a good summer or two in my youth chewing up the pop charts and I kind of dug the song. But then I found out that Patti Smith had done what I thought at the time was the original (turns out none other than the Boss himself, Bruce Springsteen wrote the song originally) so I ran down a compilation of Patti Smith's greatest hits, snagged it and gave it a listen. It was awesome. (Along with 'Gloria', 'Summer Cannibal', 'Dancing Barefoot' and a great cover of 'When Doves Cry'.) 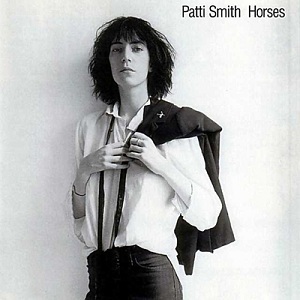 But the album that everyone seems to talk about when you're they talk about Patti Smith is her debut album, Horses, so I jumped on my Spotify, did some searching and gave it a whirl. The album opens with 'Gloria' which I had heard before and continues to rock. It starts nice and slow, almost like a dirge in many way and builds to a rockin' climax. The second track, 'Rendondo Beach' is reggae infused simplicity, but it's the third track, 'Birdland' that really grabbed my attention. Beat poetry, jazz infused, it slowly builds to a beautiful crescendo. It's probably my favorite track on the whole album. It's got a friend in 'Land:' which has a lot of the same elements of spoken word/Beat poetry going on, but turns left when you don't expect it to and suddenly ends up in 'Land of A Thousand Dances'. Which needless to say, I wasn't expecting at all. 'Break It Up' and 'Free Money' also seem to fit well together on the album. The former is a big, mournful, majestic ballad (a tribute to Jim Morrison of The Doors) and I couldn't quite figure out the latter- it seemed to have, weirdly, a Jefferson Airplane vibe to it. Which worked for me, because, well, I like Jefferson Airplane. 'Elegie' is a beautiful ballad that reminded me a lot of Smith's take on 'Because The Night'. It's spare, mournful- pretty much just her voice and the piano until it culminates in a tribute to her idols- in this case, deceased rock God, Jimi Hendrix.